AMEEGA’s musical directory is the reunification of theirs. Zo RAMAROMISA is the legal owner of all songs and is a member of the SACEM (French copyright society ). Towards the end of 1979: Zo integrates FUNK into his first compositions in Madagascar. Thanks to the crazy exhuberant feeling of this USA imported music, the new sounds, with a powerful stance unknown of until then: the FUNK ! Among his first songs are « Give Me A Pinch », and « The Happiest ». 1985: Z. POINT his first funk band in France. Z. POINT plays on many regional stages from the South East of France (Grenoble), with it’s own personal FUNK compositions; with more than 200 concerts under their belt, Zo’s original music represent FUNK’s founding stone both in Madagascar and France. This music is very much alive having been played both on stage and in the media as well as being put on the market. In 1987, Z . POINT becomes The SMILE. 1987: Meeting with Dazz Band & SOS Band. With his new band, The SMILE, Zo makes it to Annecy for a one of a kind concert… The bill features such artists as : Dazz Band, SOS Band & Kool & the Gang, some of FUNK’s main representatives. After witnessing their performances, and a backstage meeting, Zo invites them for a cold beer. It seems this cold beer seduced quite a few of the musicians which gave him a chance to have his music evaluated by some of the best in the business. « The Happiest », « Give Me A Pinch » (demos), were the ones for this test. Their comments were : “That compares to the best of what’s current in the US right now, so don’t change anything and don’t EVER give up!”. A moment Zo’s never forgotten : it was 5.30am that day! 1988: Wiz Qui Peut, on TF1 (France’s major TV channel). The SMILE does 4 prime time appearances on TF1, a rare chance to show a huge audience that a FUNK band really exists in France. 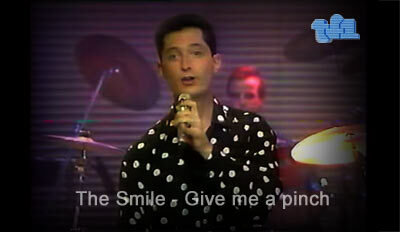 In 1989, The SMILE becomes Ze SMILE. 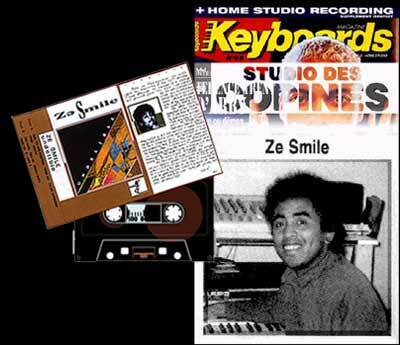 1993: Z. IMPEDANCE Records releases Ze SMILE’s first album. Z.IMPEDANCE is Zo’s own FUNK label created in Grenoble (France) and at the same time Zo choses AMIGA LOBA as his producer’s name. Ze SMILE’s showcase album is released on audio cassette with the track « Undelible ». This album shows two sides of the band’s music, FUNK & TERNO (a mixture of FUNK and madagascan traditional music entirely created by Zo’s vision). Sold in the Rhone-Alpes region and in Madagascar, it received rave reviews from magazines such as : Keyboards, Ecoutez voir, Midi Madagascar, etc... with “authenticity” and “creativity” being among the qualities put out forward. That was the beginning of a series of numerous concerts. Zo became Amiga. In 1998 Amiga decides to retire from stage activities for a while to get a second breath while still composing for his two bands. He enters the world of multimedia and aeronautic. Z. IMPEDANCE stops all activities BUT a lesson has been learned : now each of Amiga’s styles will bear it’s own musical identity, that is to say Ze SMILE for TERNO music, and AMEEGA for FUNK! 2002: AMEEGA, comeback via Internet. Thanks to Internet, Amiga gets in touch with FUNKYSIZE.COM website, which brings together the biggest number of FUNK fans in France. To his disbelief he receives a lot of support from the members as well as their wish to see an album come out… well enough to rev up the machine again! 2005: « The Golden Ages » album. Amiga Loba produces « The Golden Ages ». 1st album released on CD (in limited pressing), distributed by french BOOGIE-TIMES label, a record company specialized in FUNK reissues in USA, Japan, Germany and Brazil. As the title indicates, Amiga talks about FUNK’s golden age. The 11 tracks were composed between 1980 and 1987. The album is sold-out within a month from it’s release date! The aura of the band takes off instantly especially among Japanese and Californian FUNK aficionados. 2007: FIRST virtual album : « La Magie Est De Retour ». Amiga settles in Dijon and produces the FIRST virtual FUNK album with FUNKYSIZE.COM (which has started the independent FUNKYSIZE Records label). Entitled “La Magie Est De Retour”, the concept was to put together an album using the talents of the website’s musicians via MP3’s exchanges. A very interesting venture, since 90% of all the participants (13 tracks) never actually met physically! Amiga decides to stop its stage absence. He calls his former Keyboard player Zazz (Ze SMILE) and jumps into the occasion to open for the legendary D.TRAIN in Lyon France, for a event called "LA GRANDE NUIT DE LA FUNK". 2008: «Funkysize Now Babe », puts AMEEGA on an international level. Following an urgent need for a VINYL edition on the part of the DJ fans (refering to « The Golden Ages » vinyl), Amiga Loba produces a 4 track 12” single together with FUNKYSIZE Records, still distributed by BOOGIE TIMES in the USA. The band’s image expands through the work of local DJ’s and the many YouTube videos thanks to the fans ! « Funkysize Now Babe » is a hommage to the french FUNK website. Ameega shoots the video of the song « Home Made Love » with the talk-box artist Man-Man. It is the first official video of Ameega. The scenery shows obviously we are back in the eighties. The editing is kicth and the movie effects are typical. 2009: AMEEGA brings his face to light on Youtube. After the web shop DUSTY GROOVE AMERICA from Chicago has discribed AMEEGA as "a very mysterious guy" a footage by Christian Labbé for FUNKSYSIZE Records is made. This document entitled "Rencontre avec AMEEGA" (Let's meet AMEEGA) finally puts a face on the mysterious author-composer, shows its world, creativiy and timeless passion for music. Album « Pure & Timeless Emotions » & Kooloy. PROJECT. 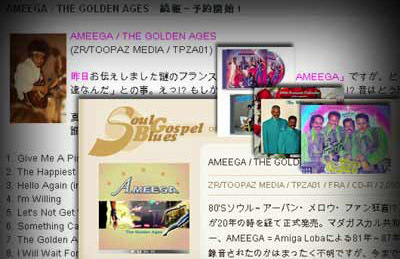 Amiga Loba produces Ameega’s second CD «Pure & Timeless Emotions », co-produced and co-distributed by FUNKYSIZE Records & BOOGIE-TIMES Records, in the US, in JAPAN & In Europe. Two tracks from this cd will join AMEEGA's classics: « This Time Love's 15 » et « Lite Up Ze Faira ». With 2 Albums in circulation, Amiga Loba teams up with the KOOLOY. PROJECT, in order to build up new foundations for the live band. 2010: Ze SMILE CD album and the TERNO sound, « Aky Tsemboka ». Amiga Loba thanks to his AMEEGA’s experience produces « Aky tsemboka ». Yes, the other music ! 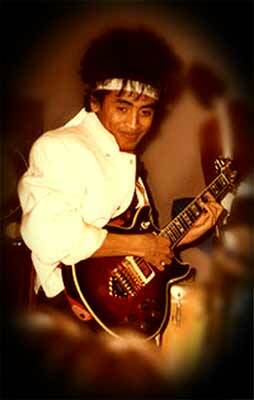 Ze SMILE and it’s TERNO style (World Music), a music still in it’s infancy although being created back in 1982. 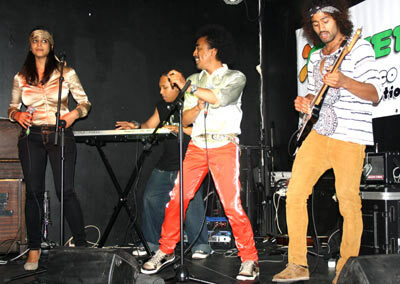 The band introduces TERNO in 2011 by participating at the RNS (Rencontre Sportive Nationale) of the Madagascan diaspora in Mulhouse in front of a 5000 audience. 2011: collaboration with the GAVINO dance company. Amiga enters the stage in the Dijon Opera theatre. He creates a choreography based on a modernized tradionnal malagasy dance and uses the TERNO styled song « Andro Fety » of Ze Smile. 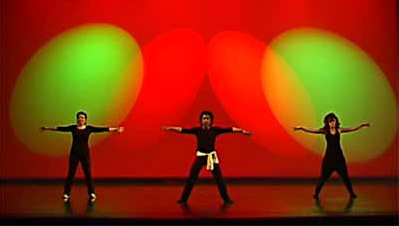 He dances with SAN (Hip-HOp dancer) and JENNY (Modern-jazz dancer). The show ends up with a STANDING OVATION ! The AMEEGA live band is born. AMEEGA shoots its second official video of the song « Lite Up Ze Faira » with Lahina, Mc Gyver, Toandry-le-gasy and the dance company DENSITE. 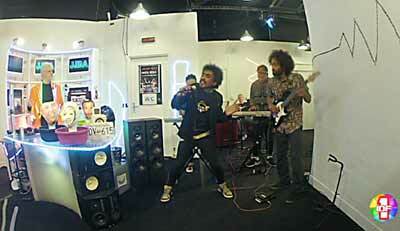 LAHINA (backup singer) , MC GYVER (Guitar), and RAMAN (Synth-bass) integrate the band. The brand-new live band works on the song list, and the first show occurs in Paris thanks to Christian Labbé and Kooloy. PROJECT. 2012: First California tour combined with the release of the « Fly me to Sierra Alpha” EP. Unexpectedly, DJ DEBO, a Californian concert promoter made a trip to France to offer AMEEGA (the 4 piece band) 4 dates in Los Angeles and celebrate the 3 years of the existence of the FUNK FREAKS crew. It seemed that through the albums, the band had become a local ‘standard’, almost a legend. By some strange twist, most of the local fans seemed to think that AMEEGA had split since they believed it was an 80’s band. Right away Amiga composed ”Fly Me to Sierra Alpha” (Santa Ana) to prove them wrong, while the song talks about the “L.A boogie homies”. 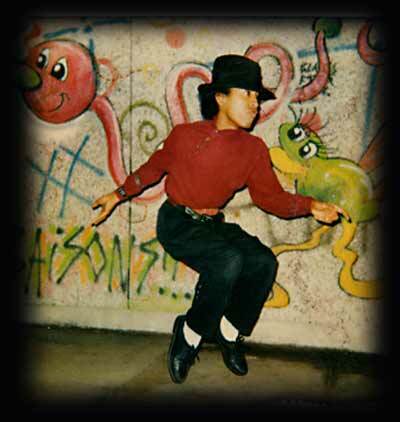 AMEEGA was introduced to the Californian fans as the ”THE LAST MOHICAN” of this kind of FUNK with, as opening acts, highly regarded FUNK, P.FUNK, G.FUNK, such as SLAPBAK, XL MIDDLETON and CARMEN. Highly motivated by the US audience response, AMEEGA was still almost unknown in France and decided to display it’s music to greater numbers. 2014: The European Radios and web-radios campaign. EP named « Lady You're Dynamite ». ZOÄR joins the band as Keyboard player. Amiga moves and settles in Montpellier. The compulsive touring now spreads all across France in Paris, Lyon & Montpellier. 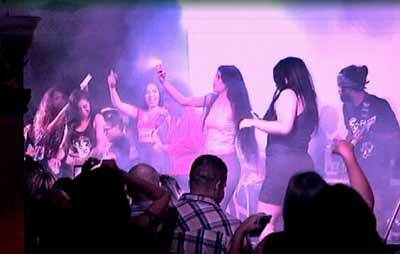 AMEEGA begins to perform in apartments for private parties and displays dynamic and festive mini-shows. 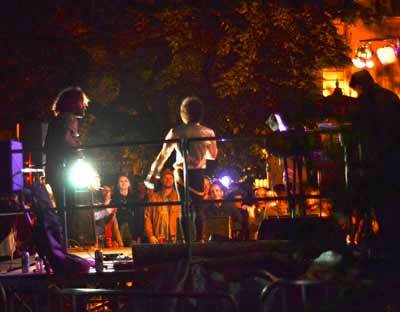 Afterwards, the band blocks off and cracks the major local Montpellier's downtown bars. An event named "BAL FUNK" which gathers 3000 peoples, occurs right in the center of the town, and AMEEGA is the only FUNK BAND that fits to it ! And AMEEGA was upper to it ! Every show leaves a lasting impression on the audiences as it’s their first FUNK concert ever for many of them! The Band is now known by Montpellier people as "the Funk band from Cali". Kooloy. PROJECT makes an event named "CALI BOOGIE FRIDAY" at "Le Dieze" and invites DJ DEBO representing FUNK FREAKS to share the stage with AMEEGA. Comes August and its is AMEEGA's turn to be invited by FUNK FREAKS USA for their sixth year's celebration. Since the first AMEEGA's venue in 2012, the crew from Orange County has reinforced its status of major FUNK BOOGIE promoter. In few years, they could host some huge artists such as COOL MILLION, HOWARD JOHNSON. The 2015 events like the releases of DAM FUNK, MAYER HAWTHORNE and BRUNO MARS seem to show a kind of revival of FUNK BOOGIE. 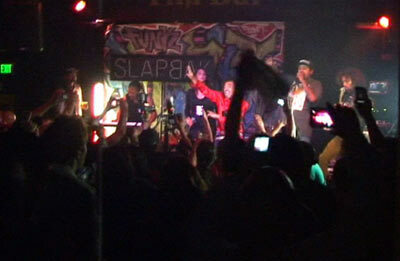 The all L.A. claims to be the eternal FUNK cradle, and it is in this context that AMEEGA meets his Los Angeles audience and tears the roof of the venue. This time they share the bill on three dates, at three places (Los Angeles, Santa Ana, Riverside) with FUNK bands XL MIDDLETON (MoFUnk Records) and OZONE (Motown Records). The audience, fans of the band since 2005 are singing along during the performances ! Amiga thanks them and says: "THIS SONG IS NO LONGER MINE ! IT'S YOURS NOW!"